At the heart of Fair Trade is the commitment to gender equality and non-discrimination. Fair Trade Principle 6 requires Fair Trade enterprises to ensure this along their supply chains, to have a policy in place to promote equality between men and women and to provide equal pay for equal work. To complement their commitment to the principle, members of WFTO provide capacity building for women in their organisations. 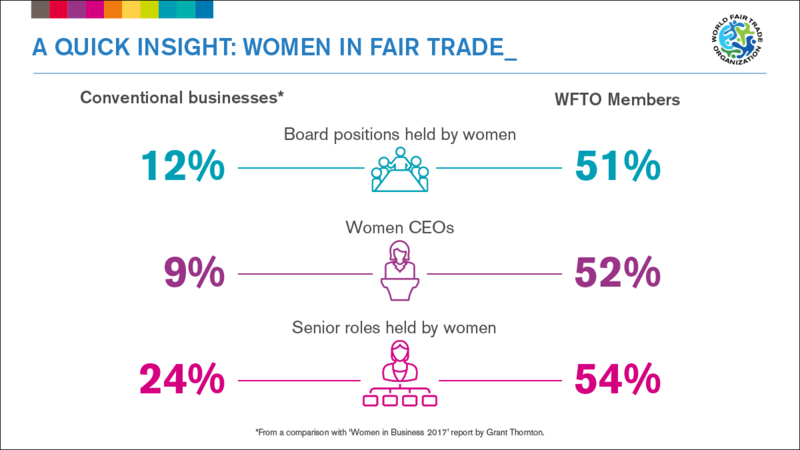 Fair Trade is leading the way to gender equality and women’s empowerment through encouraging women to take up decision-making and leadership positions in their organisations. WFTO members are showing a vision of a future where women’s leadership is a reality. Sustainable development requires gender equality. We know that empowering women is critical to addressing global challenges like poverty and hunger. When women take their rightful place alongside men as equals – across society, the economy and the workplace – our world becomes a better place. The challenge is urgent and there is no reason to delay action. We need the business world to embrace women’s leadership, and focus on empowering women workers and producers. Fair Trade enterprises across the world are showing this is possible. For a school campaigns, you may use our IWD 2018 visuals, get them here. WFTO Infographic. Figures are based on a study of 110 WFTO member Fair Trade Organisations, and are the preliminary results of an ongoing study.